The federal government has announced its plans to legalize cannabis in July of 2018. In preparation for legalization, the GNWT is gathering input from NWT residents about how cannabis should be regulated in the NWT. The input collected at the public engagement sessions will build on the responses already received from the online cannabis survey. 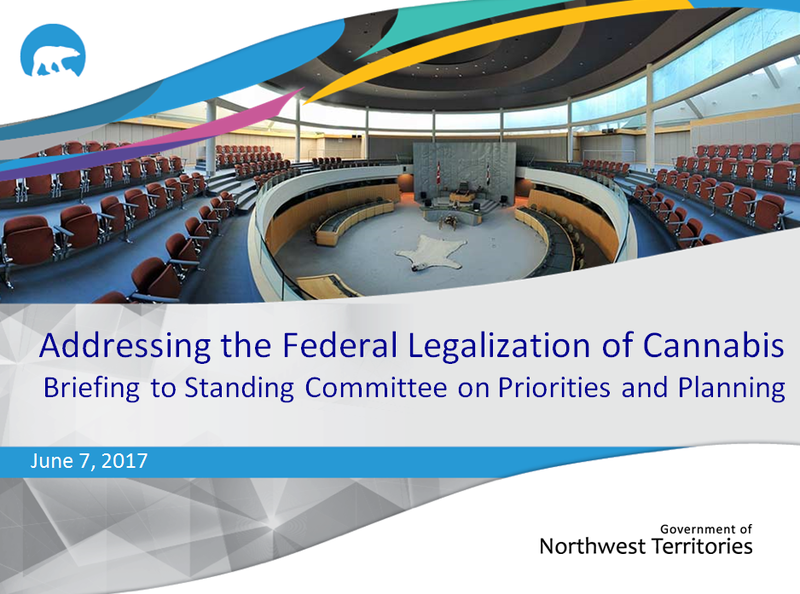 Together, the information gathered will help guide the GNWT as we make specific plans, including developing the new legislation that will be needed for cannabis. Any residents who are unable to attend a community meeting but wish to provide input please send comments by email to cannabislegalization@gov.nt.ca or complete the online survey at https://www.eia.gov.nt.ca/en/cannabis-legislation. Those who wish to participate in a meeting in an NWT official language other than English are asked to contact (867) 767-9158 or email cannabislegalization@gov.nt.ca. For more information, click below to view the document prepared by the Department of Justice for the Standing Committee on Priorities and Planning.